What is it that makes a wild mustang buck against authority, against any notion of restraint? And what can be done to tame it? The same questions could be asked of Roman (Matthias Schoenaerts, BULLHEAD), currently idling away in a state prison for a violent crime. He’s a man of quiet intensity, combustible when provoked and difficult to understand. Even his own daughter (Gideon Adlon, BLOCKERS) doesn’t know how to break through to him. Then Myles (Bruce Dern, NEBRASKA) enters Roman’s life. A veteran trainer, Myles heads a program where convicts can assist him in breaking in wild horses as a part of their state-mandated social rehabilitation. Roman makes the cut and is accepted into the program, where he finds his own humanity by way of taming a seemingly unbreakable mustang. 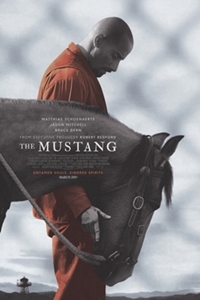 The feature directing debut from actress Laure de Clermont-Tonnerre (THE DIVING BELL AND THE BUTTERFLY), THE MUSTANG is the powerful tale of a man learning to rein in his wildest instincts in order to grow.